Leicester, Oct 12 (IANS) — After requests from the local Asian community of over 250,000, the Environment Agency has approved ceremonies in which the ashes are scattered across the water. A boat hire company has been authorised to provide a customised service for the funerals, which are increasing in demand. Shastriji Prakashbhai Pandya, a Hindu priest who officiates at the ceremonies, claimed that the Soar was an acceptable alternative. “When I close my eyes, this could be the Ganges,” he told the media. Flanked by fields, trees and a caravan park near the village of Barrow upon Soar, the river is a beauty spot where the only noise is made by the ducks. It is a sharp contrast from the scene at the ghats of Varanasi or Hardwar. 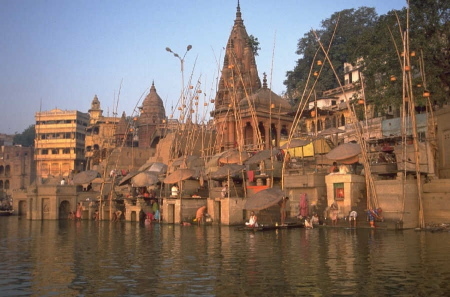 Pandya, who officiated at Ganges ceremonies before coming to Leicestershire, said that ceremonies on the Soar were becoming popular. “Often it is difficult for people to go to India to scatter the ashes,” he said. “It is expensive, and older family members may not be able to travel. That is one reason why people are coming here. Ceremonies take place on a secluded river bend between the villages of Barrow upon Soar and Mountsorrel, where the Soar meets the river Wreake. Narrow boats are hired for 55 pounds a time and boarded by close family. The ashes are scattered, along with flowers, powder, tulsi grass and holy leaves. Frank Reeves, the owner of Barrow Boating, which provides the boats, said that he had taken two bookings a week since May and that the number was rising. “We have designated a secluded place on the river, so that ashes are disposed of with due consideration for other river users. We have forbidden offerings such as photographs and metal and plastic items, which could litter the riverbank. Last weekend, Harish Raithatha, 44, from Leicester, went on the Soar with 12 family members to scatter the ashes of his late father. The Soar is not the only British destination for Hindu and Sikh ashes. The Environment Agency has also authorised ceremonies on other rivers, including the Thames and the Wye.